This extraordinarily flexible and versatile wall and column formwork is highly efficient and provides an excellent concrete finish for any vertical structure in building construction and civil works. Shape: individual panel shape with standard parts. Concrete Finish: excellent results for fair-faced-concrete surfaces and predefined wall pattern of form ties. Concrete Pressure: adaptation of panel design according to demanded concrete pressure by adjusting the timber beam and waler spacing. Flexible and versatile system for any geometry. Excellent concrete finish and suitable for concrete surface designs. Adaptable to defined concrete pressure. Easily replaced panel board eases the reuse of panels and ensures a perfect concrete finish. Panel joints are simple, adjustable and watertight; the requirement for fillers between panels is minimal. Easy joining of walers and timber beams. Shipping of not assembled material reduces the transport volume. Simple and convenient attachment of safety items to the panels guarantees safe handling. Using common standard accessories of other ULMA vertical formwork systems such as push-pull props, climbing brackets, anchors, etc. 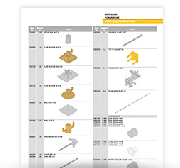 For more information download the Enkoform System product catalogue.